Several studios have attempted to make a decent South Park game only to be met with results ranging from pure mediocrity to just plain bad. The formula for quality shouldn’t have been that hard to come up with: have Matt Stone and Trey Parker heavily involved in the creative process and what you get is South Park: The Stick of Truth. It’s an almost perfect recreation of the show in video game form. The Stick of Truth’s premise is quite simple. 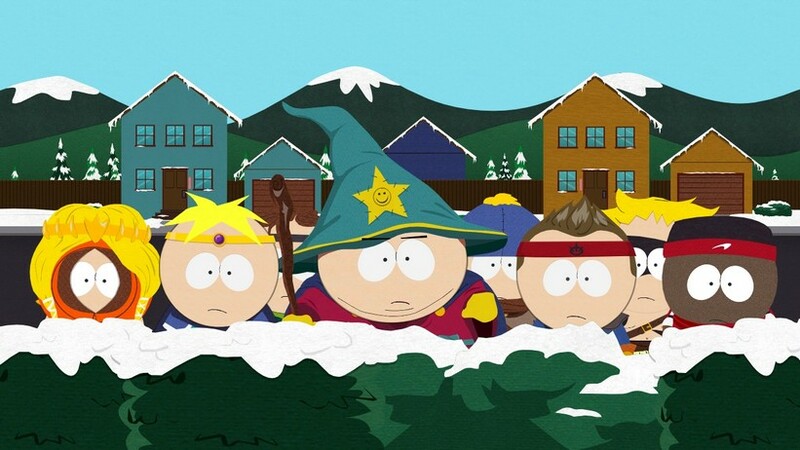 You play a new kid just arriving in the quiet mountain town of South Park. Your parents had to move after some mysterious incident which apparently you do not remember. It’s also entirely possible that your character does remember it and just refuses to comment, much as he refuses to speak for the entirety of the game. Either way your parents shove you out the door to go make friends. Going outside to make friends ends up with you becoming involved in a massive, town-wide, role playing game all centered around the glorious Stick of Truth. You quickly befriend the human-side of this war, represented by Cartman, Kenny, Butters and others. They are fighting the elves (Stan, Kyle, Jimmy, etc.) over control of the Stick, the holder of which can control the rules of the universe. Obviously this is South Park so this simple premise becomes convoluted and incredibly twisted over the course of the game, until you almost forget all about the Stick. Perhaps the coolest thing about this game is how you essentially get to insert yourself into the world of South Park. You choose exactly what your character looks like and what he wears. Being able to craft your own South Park-looking character is really cool. And being able to take that kid and interact with Cartman, Kyle, etc. is just a really great experience. 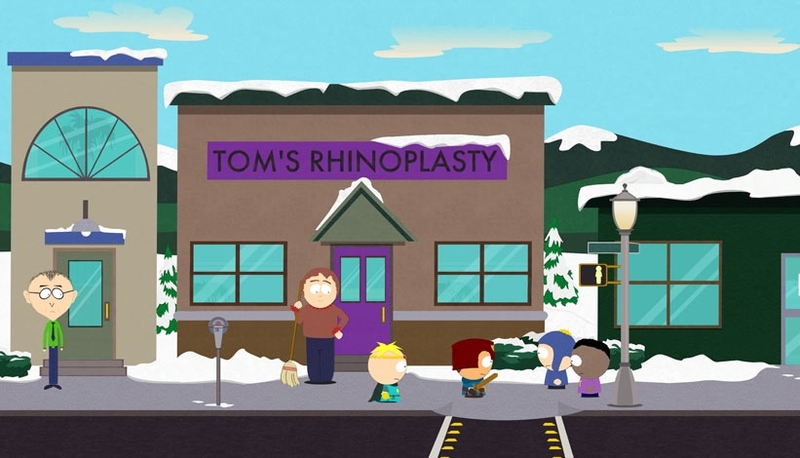 Another thing that makes this the perfect South Park game is that the entire town is open to explore. This also means that you can wrap your head around the physical town of South Park and the various locales. Visit City Hall, go to the school, walk by Stark’s Pond. It’s not a very big open world – South Park is just a quiet mountain town after all – but there is a ton of fan service thrown in if you root around in the city. The Stick of Truth also wins because it looks and feels just like the show. Your character does the same South Park wobble and all objects are flat and two dimensional. The voices are perfect and the sounds and style are exact. You are essentially playing an episode of the show which is an impressive feat. Not that it’s a graphical challenge or anything like that but the feeling of the show is just so perfectly captured. 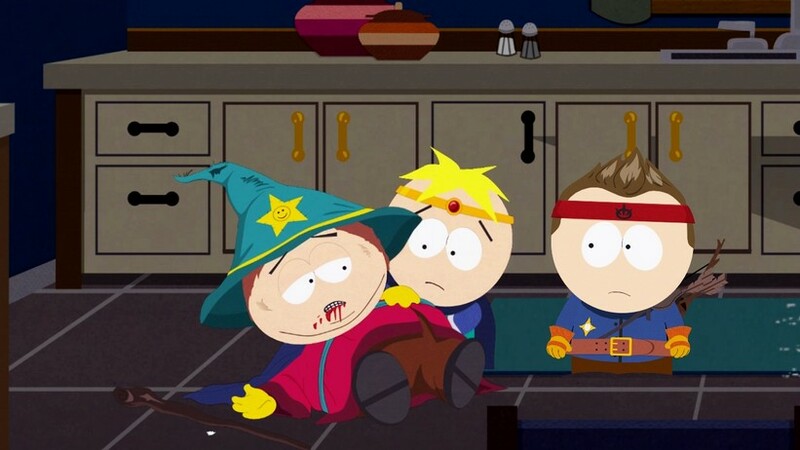 On the base level The Stick of Truth starts out as a bunch of kids larping and casting fake spells on each other. It quickly turns into something that isn’t exactly fake any more but still has a hint of child’s play. You go from fighting dress up elves to beating up animals, bums, SWAT officers, and plenty more twisted things. All the interactions still have the sheen of “just playing” on them but when you step back and look at it, you are actually injuring/killing with devices such as fireworks, fire extinguishers, blunt objects and much, much more. The gameplay is pretty standard turn-based RPG mechanics, pulled from old-school JRPGs. In battle you have yourself and one other buddy to help. You can use melee, ranged, abilities, magic or summons to help defeat your foes. Each attack will involve some type of button command to reach full potential, similar to old-school Super Mario RPG. Some will be just a simple timed button press while others will be more complex like spinning the left stick or a sequence of different buttons. The same system works for blocking, where you must time your block to help reduce damage and try to avoid debilitating effects. It’s a great system that makes each battle significantly more fun than just choosing an option and watching the result. On your turn you get two moves: one use of an item and one attack. As a result of always being able to use items, rather than it taking up an attack, you’ll find that HP bars are much more fluid, going up and down fast rather than just slowly ticking away. Having a buddy with you that also gets his own item and attack means that you can almost always survive a fight as long as you are vigilant in blocking and using items to recover HP, revive and remove status effects. You start out with just basic abilities and weapons but over the course of the game you really get the chance to grow your character as you see fit. Each level up lets you improve an ability which unlocks new changes rather than just damage increase. This could mean a shocking attack that only hit one enemy now chains to others or a powerful fire attack now eats away at armor in addition to just damage. You can easily see what each ability level will grant you and you won’t be able to put points into everything so you have to pick and choose for what you like. Your actual equipment will give you various bonuses and abilities beyond just the simple visual change. Each item will be drastically different, offering things such as increased armor, extra PP (used for abilities) or bonuses against certain types of enemies. You can also augment your equipment through stickers that grant further extras such as health regeneration or extra elemental damage. It’s a pretty deep, rewarding system that gives you a lot of options for how to play the game. All stickers are reusable too, so swapping out equipment or trying new strategies is easy. The combat and equipment might sound like it’s fairly complex but in general, it’s pretty approachable. The game never really gets difficult. You constantly find items that can be sold so money is never an object in the game. Meaning you can easily have a fully stocked supply of health items at almost all times. Also, once you get the hang of how the game works, it’s relatively easy to deal with each new situation. Boss battles can be tricky sometimes but it is always a case of just using the proper abilities/strategies and making sure you are using items every turn; there is no grinding in the game or brick walls where you die over and over again. The combat is more a means to an end, albeit a very fun means. The real reason you play The Stick of Truth is to experience the story and situations that have been concocted for the game. To be perfectly clear, this is about as South Park-y as a South Park game can get. Lots of stuff is incredibly over the top, crude and just plain offensive. Early on in the game I found myself surprised with the stuff they were getting away with. That early questionable material, it turns out, was just the tip of the iceberg as you find weirder and even more offensive stuff the longer you play. It’s almost all excellent material, although similar to an entire season of South Park some stuff hits perfectly while other stuff falls flat. One of the main jokes that consistently falls flat is the way “magic” works in the game. “Magic” is just farts and various characters teach you different fart techniques that can be used both in and out of battle. The entire fart mechanic is done poorly and few of the jokes or situations revolving around farts work. Still much of Stick of Truth is quite amusing while other parts are enjoyable just for the pure shock value. While almost everything works great in South Park there are some definite faults. For an open world RPG it is actually pretty short. The game took eleven hours in total to beat, including completing every side quest. It’s an incredibly linear story so replayability is basically limited to trying out the other classes or getting some collectibles that you missed the first time. The game is also quite glitchy, with many moments of stuttering frame rates and the occasional audio or graphical hiccup. It’s most concerning because the game is in no way a technical feat so there should be no reason for frame rate problems, even if it is on last-gen hardware. 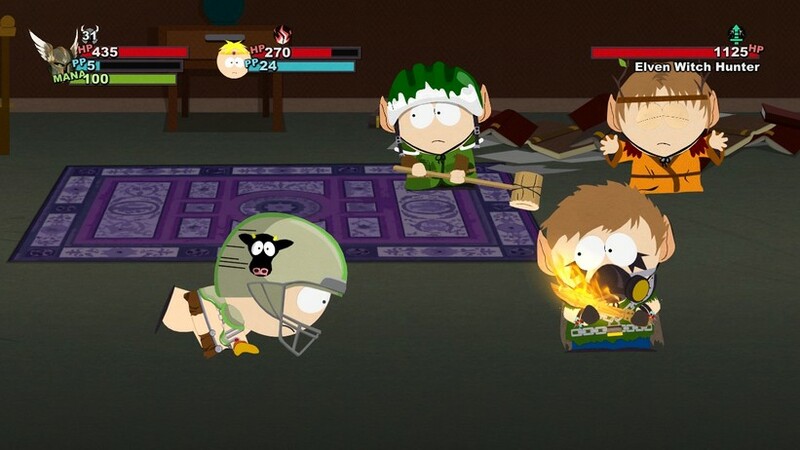 South Park: The Stick of Truth is about as perfect of a South Park game as there can be. It’s crude, it’s offensive and it’s full of fan service. It also offers a very enjoyable combat system that is filled with creativity. Where else would your lightning attack be a simple bucket of water combined with a car battery? 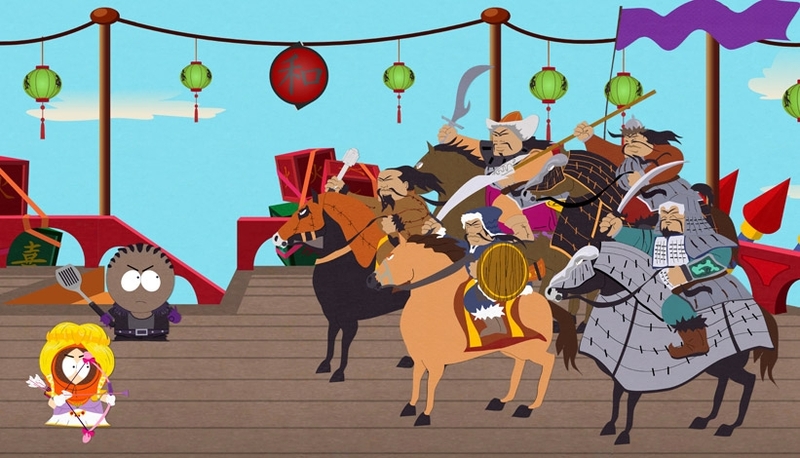 Just beware that if you don’t like South Park or have been offended by the show in the past, this game is not going to be for you. If you are a fan, even if it’s just casually, you are bound to enjoy The Stick of Truth. Tags: Obsidian Entertainment, South Park: The Stick of Truth, Ubisoft. Bookmark the permalink.